Reporter-Curator: Stephen J. Williams, Ph.D.
Clinically, there has not been much success in treating solid tumors with histone deacetylase inhibitors (HDACi). Histone acetylation and deacetylation play an important role in transcriptional regulation of genes and increased activity is associated with many cancers, therefore it was thought that HDAC inhibition might be fruitful as a therapy. There have been several phase I and II clinical trials using HDACi for treatment of various malignancies, including hematological and solid malignancies(2), with most success seen in hematologic malignancies such as cutaneous T-cell lymphoma and peripheral T-cell lymphoma and little or no positive outcome with solid tumors. Many mechanisms of resistance to HDACi in solid tumors have been described, most of which are seen with other chemotherapeutics such as increased multidrug resistance gene MDR1, increased anti-apoptotic proteins and activation of cell survival pathways(3). A report in PLOS One by Dr. Dejuan Kong, Dr. Fazlul Sarkar, and colleagues from Wayne State University School of Medicine, demonstrate another possible mechanism of resistance to HDACi in prostate cancer, by induction of the epithelial-to-mesenchymal transition (EMT), which has been associated with the development of resistance to chemotherapies in other malignancies of epithelial origin(4,5). EMT is an important differentiation process in embryogenesis and felt to be important in progression of cancer. Epithelial cells will acquire a mesenchymal morphology (on plastic this looks like a cuboidal epithelial cell gaining a more flattened, elongated, tri-corner morphology; see paper Figure 1) and down-regulate epithelial markers such as cytokeratin, up-regulation of mesenchymal markers, increased migration and invasiveness in standard assays, and increased resistance to chemotherapeutics, and similarity to cancer stem cells(6-10). 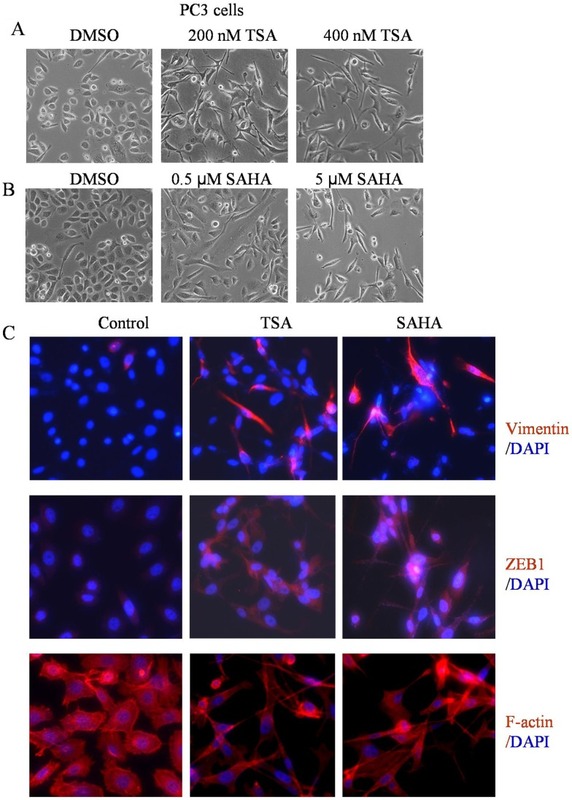 In this study the authors found that treatment of prostate carcinoma cells with two different HDACis (trichostatin A (TSA) and suberoylanilide hydroxamic acid (SAHA)) induced EMT phenotype mediated through up-regulation of transcription factors ZEB1, ZEB2 and Slug, increased expression of mesenchymal markers vimentin, N-cadherin and fibronectin by promoting histone 3 acetylation on gene promoters. In addition TSA increased the stem cell markers Sox2 and Nanog with concomitant EMT morphology and increased cell motility. Clinical experience of histone deacetylase inhibitors (HDACIs) in patients with solid tumors has been disappointing; however, the molecular mechanism of treatment failure is not known. Therefore, we sought to investigate the molecular mechanism of treatment failure of HDACIs in the present study. We found that HDACIs Trichostatin A (TSA) and Suberoylanilide hydroxamic acid (SAHA) could induce epithelial-to-mesenchymal transition (EMT) phenotype in prostate cancer (PCa) cells, which was associated with changes in cellular morphology consistent with increased expression of transcription factors ZEB1, ZEB2 and Slug, and mesenchymal markers such as vimentin, N-cadherin and Fibronectin. CHIP assay showed acetylation of histone 3 on proximal promoters of selected genes, which was in part responsible for increased expression of EMT markers. Moreover, TSA treatment led to further increase in the expression of Sox2 and Nanog in PCa cells with EMT phenotype, which was associated with cancer stem-like cell (CSLC) characteristics consistent with increased cell motility. Our results suggest that HDACIs alone would lead to tumor aggressiveness, and thus strategies for reverting EMT-phenotype to mesenchymal-to-epithelial transition (MET) phenotype or the reversal of CSLC characteristics prior to the use of HDACIs would be beneficial to realize the value of HDACIs for the treatment of solid tumors especially PCa. Closing the gap towards real-time, imaging-guided treatment of cancer patients. Thank you for this post which will enter our Cancer e-Book, Prostate Cancer, chapter and the Cancer Biomarkers Chapter. As Senior Editor of the e-Book, please approach all the other editors and other cancer EAWs and split the burden of this task by splitting the Cancer types among the EAW, like we had a major Team effort for Nitric Oxide — which was VERY successful and the e-book is due 12/30/2012 for me review. EAWs to select theirs, first, then the assigned to be assigned. Thank you, it is always a joy for me to set aside all tasks to read your post and edify myself with the variety of your selection. I hope that you find my post of interest. I am always behind. This is an excellent presentation relevant to carcinogenesis and resistance. The morphological transformation is obvious, and the cellular markers are standard in the practice of surgical pathology. I think that the inclusion of so many organ/tissue cancers is unnecessary, and could impede the presentation of the best possible final product. What we argued about in 1920, when Otto Warburg hypothesized that cancer cells use the Embden Myerhoff pathway to produce energy by glycolysis (converting glucose to lactic acid), and the then unknown TCA cycle is used for syntheses. This was Nobel Prize work on respiration and ANAEROBIC glycolysis in carcinogenesis. The work was challenged, and the challenge was refuted. In 1934 Szent-Georgy, later a Nobelist for the isolation of Vitamin C, nominated Warburg for a second Nobel for his discovery of flavins and pyridine nucleotides. Later again, his other student and biographer who won the Nobel Prize, Sir Hans Krebs, worked out the TCA or Krebs cycle, which required FMN and and NADPH (then termed TPNH) for hydride transfer. That was not the last word, as Fritz Lippman, then at Johns Hopkins, discovered the importance of the P* in ATP, with his collaborators, Nathan O Kaplan and Sydney Colowick, for which he received a Nobel Prize. In comparing the anaerobic glycolysis with the tricarboxylic acid cycle (TCA), there is an energy difference of 26 ATP’s. So the high energy phosphate bond is an essential adaptation (derived from the chloroplast) to an oxygen rich environment, and structurally has an inner and an outer membrane. Much important work on the cytochrome and electron transport system by Mitchell. But there is more to the story. Kaplan called attention to the TPN_DPN transhydrogenase and later presented this in his Harvey Lecture at Harvard. There is an important interconversion, and he hypothesized that organs are either main anabolic [synthetic (TPN)] or mainly catabolic [fuel burning (DPN)]. The TCA cycle can go either way, as Fyodor Lynen won a Nobel Prize for demonstration the synthesis of lipids with the Lynen Cycle with the same basic mitochondrial reaction used by tumor cells. Another phase came in experimental pathology by Frank Dixon, who worked at Pittsburgh, and later became the Director of Scripps Institute working with fast growing and minimal deviation hepatomas. So the notion took hold that there is a multisatep transition from benign to malignant in degrees of anaplasia. The hypothesis became stronger that the neoplastic cell is a transformation to a cell with “universal” features common to all neoplastic growths, and uncommon to the cell of origin. All of this precedes the new era of “genomics” that has mushroomed in the 21st century as a result of many improvements in the tools for research. There is a neoplasm that is referred to as a “carcinosarcoma”. What features are predominant in this cancer. Where is it most commonly found? Would you think first of the OVARY? A very accessible source is the on-line reference work in pathology, “PathologyOutlines”, Edited by Nathan Pernick. It is a widely used and successful source that is intended to be an “AFIP type source on-line”. Thank you for the historical perspective provided above. My advice to Dr. Williams for the Cancer e-book to include the list of Cancers, above, follows my intent to create Series of scientific breakthroughs, as of now, five e-Books, one on Cancer. This one, to be functional on a Kindle device, in the pocket of a PCP, requires to have among other properties, the nature of. Mini exceclopedia, in term of inclusiveness, much beyond Wikipedia. For example, we know similarities in cancer cell morphology across several Cancer Types, while the transition may be similar, other interactions in situ, may be different, thus, only a classification system across the Cancer Types listed above, will create value added to the e-content of the e-Book. Our Original exposition of transition from cell type a to cell type b in the case of the following cancer type vs transision from cell type a to cell type d, for the following types, then, the cluster discovered will function as therapeutic targets derived from and aimed to the cell level transition qualifier. That table is an input to translational medicine and Personalized Medicine via dimensionality reduction at the research phase of meta analysis on the universe of cancer type listed, above. We may need to couple transition among cell types with other factors when the transition from cell type a to cell type b serves as a dependent variable and we create a list of independent variables (x1,x2,…). Each independent variable identified will serve a list of cancer types, clustered by behavior of the (x1,x2,…). Since we review primary research, we must bring to the table of e-Book publishing a unique organization of knowledge not found in any textbook on Cancer, in this case. If my explanation left you unconvinced, we shall take it of line while Dr. Williams, proceed with the instructions, above. I thank you both for your wonderful insights. Dr. Berstein, I love the history and do lament that a “history of the flow of scientific findings” is never taught. I think researchers today might have better appreciations if they have a better understanding of the train of thought or sequence of events which led to the present day knowledge of diseases. In fact I was thinking of doing what you did concerning Dr. Warburg in highlighting a biography of him and doing this for other seminal works. The reason I chose this post is not prostate cancer specifically, but I have been interested in how now chemotherapies seem to achieve high success with hematologic malignancies however the solid tumor therapy is alot of times refractory. I am wondering if there may be need for bette understanding of these tough to tackle solid tumors. You interest in the History of science is commandable, I’ll research for you. Dr. Pnina Abir-Am, on our list of contibutors’ biographies is a historian of Molecular Biology, wrote extensible on the DNA discovery. She is my sister, a great writer, click on her name there. I was lucky to have been a master student in a course thought in 1975/76 at the Hebrew University of Jerusalem, Theory on Measurement, by Prof. Louis Guttman, he has provided a historical perspective to Statistics, Demography, Public Opibion and Genetics since 1890 on. It was this historical perspective in the evolution on the field of measurement, that influenced my professional career and pursuing 25 years in Decision Science (Masters HUJ, PhD! UCB) THEN working in measurement (1985-2004). While in PreMed as I started my secong career in Health Care, I had Prof. Cosgrove, 3 courses in micro biology, one course in genetics, one in enzymology, one in immunology. He was a GREAT biologist, that provided a historical perspective on every one of these fields. If you click on Founder on the Home Page, then click on, Tribute to my Professors, you will enjoy reading it. Regarding the concern with Solid Tumors. Please go to the comment section for Dr. Nir’s post on the SIZE of the tumor. Join the discussion, I requested, Larry, yesterday, to add hid perspective as a Pathologist. Then, please read my post of yesterday, on Cancer Cell Biology and MIS. I love this post of yours. We must contribute in the e-Books a NEW interpretation and a NEW priciple for the organization to existing knowledge, on Cancer, in the e-Book you are to edit and manage THREE editional editors which you will guide in the division of labor. I am assuming when you are speaking of carcinosarcoma in the ovary you are referring to the various histologic types of tumors which are seen in the ovary including the common serous epithelial type but there are also mucinous borderline tumor or tumors of low malignant potential (LMP. There are also epithelial stromal tumors which are in the endometriod class of ovarian cancers which can present as mixed tumors containing both epithelial and mesencymal elements. Ovarian cancer can be a hodgpodge of histo tumor types. A good reference is the book Ovarian Cancer by Rubin and Sutton. Granted I am not an expert on pathology. As to the chapters of an ebook I am more inclined to have general topical chapters such as Metabolic Changesin Oncogenesis, or Genomics impact on cancer drug discovery, or New Pathways of Oncogenesis than to separate chapters based on cancer types. The reason is that each of these topics will include various tumor types in a post. For example my research had been on a protein CRBP1 which we had found consistently lost in ovarian cancer. However at the same time there were groups all over the world finding this protein lost in breast and prostate and liver and hematologic cancers. So I feel it would be easier to Index these tumors at the back of the book so they are easily cross referenced. Also we have the unique abi8lity , given the platform to cross reference across books such as nitric oxide with cancer with genomics etc…. Thank you for your comment above, I fully support your Leadership as Chief Editor to our effort devoted to the forthcoming e-Book on Cancer. Having general topical chapters such as Metabolic Changes in Oncogenesis, or Genomics impact on cancer drug discovery, or New Pathways of Oncogenesis than to separate chapters based on cancer types. I perfectly agree with your approach and for the purpose of dimensionality reduction, I suggest one overarching multivariate classification model on Cell transition which will cluster Cancer types by such general topics that can serve as differentiators. No one had ever had the intention to have one chapter per cancer type. Criteria for dimensionality reduction will aggregate cancers by common denominators at the cell and at the tissue level. You are on the right track, leading the way with mastery of the subject matter greatest complexities. So proud of you, we are all on our Tippi Toes – I sense Success !! Larry and Aviral are currently perfecting the Table of Contents (TOC) and assigning posts to each entry of the TOC. I will touch ONLY when they will declare that first round is complete. Please yourself dig deep because they, WP have already solved the Indexing and linking and the cross referencing. Please edify yourself, and please put together JUST the material needed to Convert a BLOG to a BOOK. We may have a prospect to use same content for several version of e-Book publishing. The Cancer book will be an e-book in few versions. More to come. I am expecting a call to discuss this matter with players in the Scientific Publishing. I always run very tight ship, it is not for everyone, these who stay on course experience vast autonomy to grow under guidance and creative vision. Thank you again for your Beautiful mind and clarity of expression.